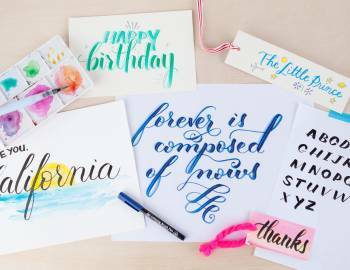 A lover of letters, lettering and letter writing, Michaela Yee is a MarCom Specialist at Sakura of America by day and artist by night. 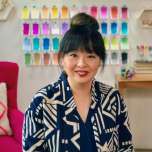 With her extensive knowledge of Sakura's product line, she creates a variety of projects on paper and alternative surfaces. Her favorite products include Koi Watercolor Brush pens and PenTouch Gold paint marker. Now based in Alameda, she is a Bay Area, CA native with a BA in Painting from UC Santa Cruz and MA in Museum Studies from San Francisco State University. Michaela has worked in fundraising for children's museums, as a gift shop buyer, as a makeup artist and in marketing and social media - all which have allowed her to study people and what inspires and compels them. She loves the water, visits to any museum large or small, travelling and eating, teaching, networking and connecting people. She is happiest with a brush or pen in hand or spending the day curled up with her husband and son watching their favorite movies and eating noodles.